The club’s 2019 AGM took place on Thursday 17th January, and plans for the coming year were discussed. Compared to previous years, there’s a bit of change this time around! There have been some changes on the club’s committee. Martin Aris has stepped down from the chairman position and taking his place is former club secretary Sam Evins. Assuming Sam’s role as secretary will be Matt Smith, a long-serving club member who makes his debut on the committee. We’re delighted to have Matt on board and we’re very grateful for the time and dedication that Martin has put into the club, from its very beginning to the present. It’s fair to say we wouldn’t be where we are now without Martin, cheers fella! In addition, Richard Coughtrey has taken up the role of vice-chairman to support the committee when required. The remaining roles of treasurer and webmaster remain unchanged, held by Gary Evins and James Clarke respectively. All in all, despite the changes, the club remains as healthy as it ever has been and we’re looking forward to a good 2019. We have a small selection of shows lined up for the first half of 2019, with more to be announced in due course. At present the list is made up of our annual pilgrimage to the south coast for the Poole Vikings show on 13th April, the Thames Con convention on 28th April and our usual display at the Bloxham Steam Rally on 29th and 30th June. Our pub themed display will be coming with us to all of the shows we do this year, so if you missed it at Scale ModelWorld back in November, or if you just want to see it again, here’s your chance! A number of smaller matters were covered in the AGM, but they’re far too tedious to be discussed here! Enough of the chat, get back to those modelling benches and get to work the lot of you! Not the identical kind though! We are delighted to announce that IPMS Middleton Cheney is now twinned with the Central Jersey Plastic Model Club from the other side of the ‘pond’. Having met one of the founding members of CJPMC, John Ezzo, during Scale ModelWorld in 2016 we were blown away by his and his club’s dedication to the hobby. We’ve kept in touch in the meantime, and like a young couple ready to take the next step, we are now officially twinned clubs, giving both a truly international flavour (or should that be flavor?!). Below is a shot of CJPMC’s meeting location in West Windsor, NJ – an outbuilding belonging to John which he has heated and air conditioned and converted into a modeller’s paradise! 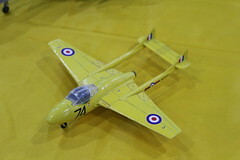 John has been building models for more than 50 years, and having been founded in 1995, the club has been meeting there since 1998. Besides an extensive built model collection John also collects American Military uniforms and now has over 70 mannequins dressed in period uniforms ranging from WWI to present day lining the walls – you can see some of them in the cabinets in the photo below. It’s an honour to have an association with a club on the other side of the world, especially one that shares our passion and outlook on the hobby as something to be enjoyed, whatever your ability. Now we’re looking forward to arranging some activities together in the future – best get checking those flights across the Atlantic! We at IPMS Middleton Cheney raise a glass and say ‘cheers!’ to our new friends Stateside! This one’s a bit late. Apologies! What seems like quite a while ago now, in April we made our annual pilgrimage to the south coast for the Poole Vikings Model Show. As we’ve come to expect, it was another very well organised event with a fantastic number of clubs and traders in attendance. Hosting shows in school buildings and the like must be difficult, but the organisers should take great credit in getting us all in and making the event that much better by having such a wide array of stands in the limited space. Our own display evolved from the previous show in Hinckley, as we narrowed down our aircraft to focus on 1:72 subjects from the Second World War. On the left, the Allied planes, and on the right, their Axis foes. The aim here is to showcase some of the more colourful and unusual planes that saw action, so there’s no shortage of variety, and certainly not a sea of brown, green and grey! In addition we had a smattering of other subjects, some ever-popular movie stars for the young ‘uns and the more pop culture savvy among the crowds. All in all, a nice variety that demonstrates that the club’s membership really does dabble in a bit of everything. In addition, a few of us got involved in the competition with both Sam and James scooping certificates, Sam mostly in the sci-fi category, and James in the civilian vehicles where he received overall silver for his Lotus 99T F1 car. On an absolutely beautiful day, we had another brilliant time in Poole and we’ll be back again next year for more of the same! Our thanks go out to the Poole Vikings club for having us and for putting on a great event. It remains one of the highlights of the club’s year. Keep up the good work guys! On the 12th March IPMS Middleton Cheney made it’s first 2017 show appearance, at the East Midlands Model Show in Hinckley. A strong contingent of seven members were there helping out on the stand and a great time was had by all. The Star Trek display was no more, replaced by a fantastic array of different genres from the membership. A smattering of movie stars made up the backdrop and were surrounded by Allied and Axis WWII aircraft, F1 cars, Warhammer and plenty more too! A big thank you to the show organisers for putting on a fantastic event. 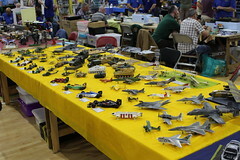 It was well-attended with a great spread of displaying clubs and many traders. We all came away with plenty more kits for the stash – some things never change! Check out the photos of our display below. We’ll be attending many more events in 2017 – we’d love for you to stop by the stand to say hi and have a chat. Next up is the Poole Vikings’ show on the 8th April. We hope to see you there! We’re delighted to announce that our first two shows for 2017 have now been confirmed. We will be returning to both the East Midlands Model Show on the 12th March, as well as Poole Vikings Model Show on the 8th April. Both shows are favourites of ours and we’re looking forward to getting back out to some events and showing off a new display. Unfortunately for all you Trekkies this year we intend to offer a broader spectrum of our members’ interests on our tables, so hopefully there’ll be something for everyone. We hope to see you at one (or both!) of the shows. Keep checking on the website for further updates on our show plans for the rest of 2017. 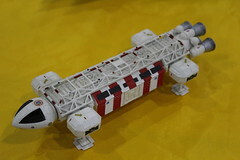 If you’d like us to display at your model show, just let us know! Check out the Contact Us page for full details of how to reach out to us.